Posted December 16, 2013 by jonmroth & filed under News. Detroit, city of my birth and upbringing, has gone bankrupt. And the Detroit Institute of Arts, an inspirational beacon of my youth, is in trouble. It was recently reported that the worth of all the art in the museum was only about $2,000,000,000, and that they might have to start lugging it all to Antiques Roadshow. They’re also going to need donations. And I owe them a lot. In my senior year of high school, I took the bus downtown every afternoon to intern in the museum’s photography department. I was a budding photographer, and they taught me everything: darkroom skills, cameras, lighting, studio basics. I helped with various tasks, and they were kind enough to let me develop and print my own work. I collected many of those photos into a portfolio that landed me second place in the country in the Scholastic Arts Awards – and also helped me get a full ride to the art school at Cooper Union. It’s hard to put a price tag on that kind of experience. Or on such an inspirational collection. 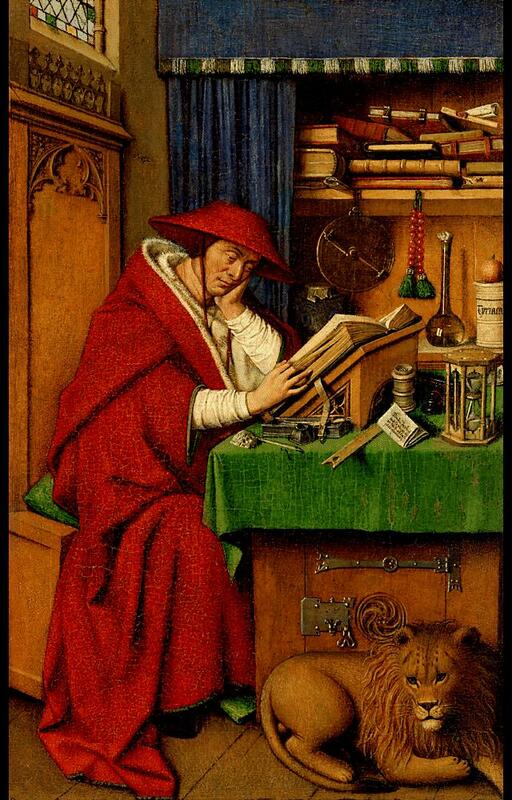 But if you did have to value such things, St. Jerome in his Study, by Van Eyck, is one of the museum’s prized masterpieces. As they were photographing it in the studio one afternoon, I was even given the chance to carefully lift and move it. It was certainly the most valuable thing I’ve ever held in my hands – worth many millions of dollars. And it only measures about twelve by nine inches. Framed. Just small enough to fit in a high school kid’s backpack. My Name is Rock. Miss Rock. Posted December 6, 2013 by jonmroth & filed under News. 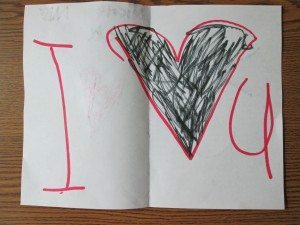 I love getting hand drawn cards from kids. Sometimes they get my name wrong, but that’s okay. 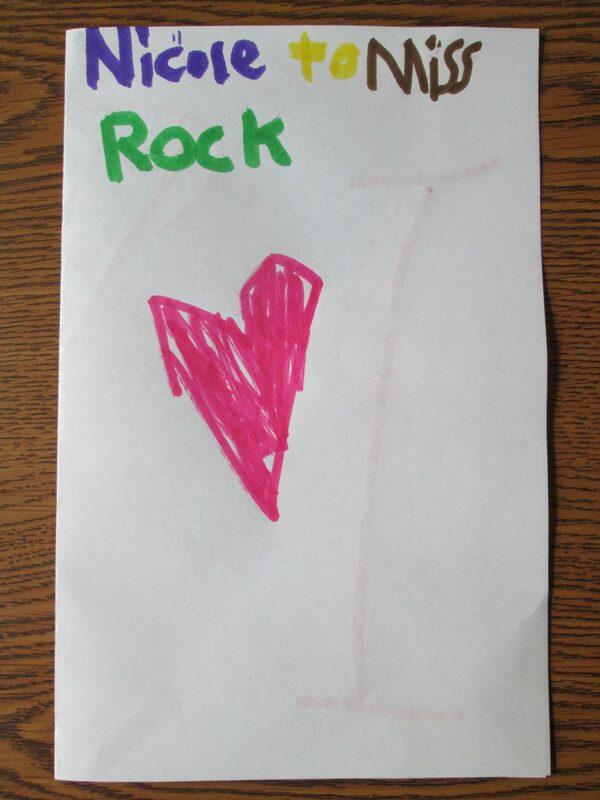 In fact, when a kindergartner miswrote Roth as Rock yesterday, I thought it was pretty cool. After all, we male elementary teachers need all the boosts of masculinity we can get. Mr. Rock. I like the sound of that. Oh, wait. 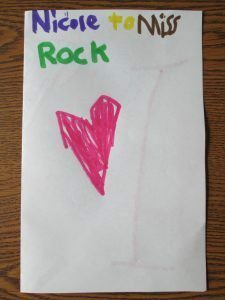 It says Miss Rock. p.s. And what’s with the black heart? What’s that supposed to mean? Posted December 4, 2013 by jonmroth & filed under News. I am a total astro-nut. I’ve read tons of books on space. 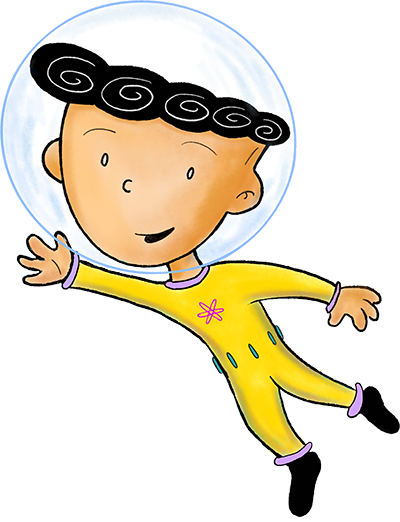 Celestial bodies have been prominent in many of my writing projects (my first picture book dummy, years ago, was Obadiah’s Moon Blues – yeah, it was as bad as it sounds). I’ve even shaken hand with two of the twelve Apollo moon-walkers. And yet somehow, until now, I’ve missed that an actual sculpture was commissioned for, and placed on, the Moon! It was not well publicized. Nor can I find it mentioned in my lunar bible, A Man on the Moon by Andrew Chaikin. But it turns out that astronaut David Scott, of Apollo 15, asked Belgian artist Paul Van Hoeydonck to create a small, durable figure, of no gender or race, to honor the (fourteen) astronauts and cosmonauts who had died up to that point in the space race. The tiny aluminum statue was called Fallen Astronaut. It was quietly placed by Scott on the Moon in August of 1971. Whoa. The artist, now 88, will be speaking next week at the Air and Space Museum here in D.C. http://airandspace.si.edu/events/detail.cfm?id=8038, which is how I learned of this. Sadly, I don’t think I can go; I’m already booked to teach the visionary artists of tomorrow. But that’s okay. I’m counting on one of their works to one day end up on Mars. 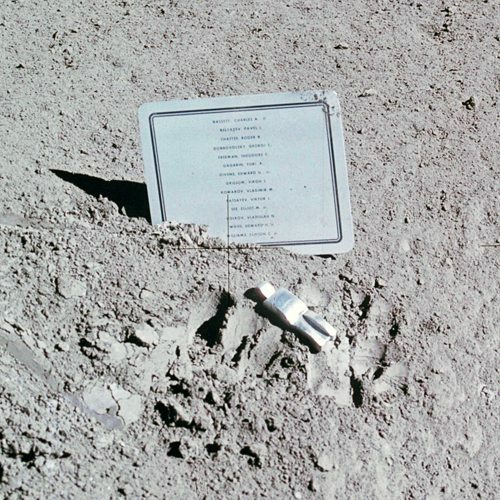 Sculpture and plaque, as photographed on the Moon. Posted December 1, 2013 by jonmroth & filed under News. Nope, definitely never any politics here. Starting nnnnnnnnnnnnnnnnnnnnnnnnow. Posted November 26, 2013 by jonmroth & filed under News. It’s a little known fact, but I’ve saved the world many times. Or at least destroyed enough invading aliens to keep the world safe. Until they destroyed me. And I had to put in another quarter. To defend Earth again. Yes, in the late 70’s I was young and so were video games. Asteroids was my favorite, and no pun intended, I rocked. Who would have thought that in only a few short decades, my awesome Atari abilities would somehow start to seem…quaint. Luckily, I have young minds to mold. Over the course of a few months, I take third graders in the Art Room through a crash course in technological design: we use clay to make ceramic bells, yarn and looms to make cloth, tagboard to design airplanes, and finally, computers. We look at old pictures of when computers took up rooms, and they instruct me about the gadgets of today. 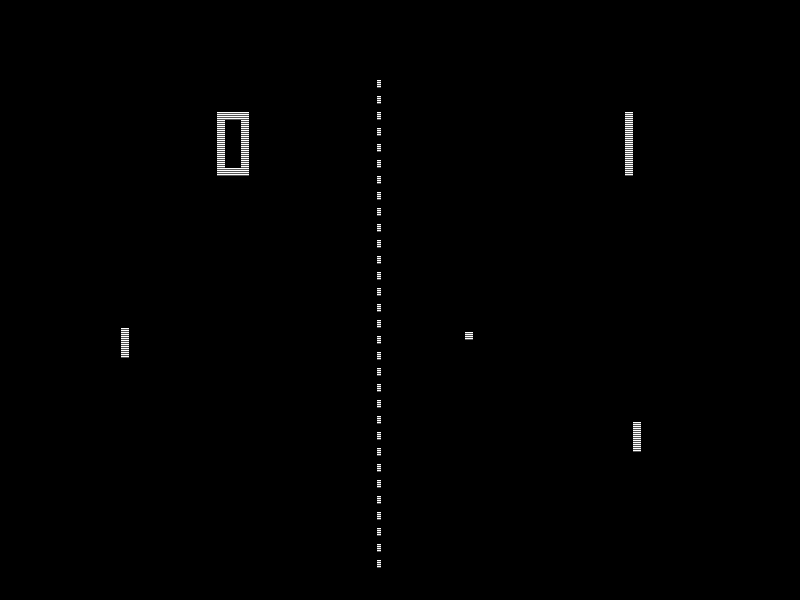 To show them how much cooler video games used to be, I draw two lines and a dot on the board and tell them this was the hottest thing in 1972. They look at me crazy. Then I go to www.ponggame.org and let them try it themselves. Soon they’re all lining up for a try, and cheering at each point their friends score off the computer. They even beg me to give them the website address when they leave. One student said he couldn’t wait to show his dad. All materials copyright 2019 Jonathan Roth. All rights reserved. Website by Websy Daisy.